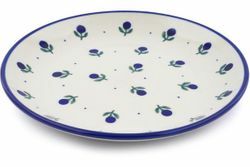 Bring a touch of art to your table with this small hand-finished Polish pottery plate. A wonderful way to enjoy a culinary delight, you can use these stoneware plates alone or pull them out for a dinner party to impress all of your guests. This colorful plate is sure to be a treasured part of your Polish pottery collection. Each stoneware plate is hand crafted at Ceramika Artystyczna factory where artisans rely on time-honored techniques to meticulously decorate it by hand.